Here is a wee outfit of the night, I would have taken a picture but unfortunately I looked like a whale. Anyway I was off to see Janet...(Miss Jackson if you're nasty) last night. I thought that I would keep things simple. I wore a white simple t shirt from ASOS. It is £15.00 and so comfortable. It can hang off your shoulder and the bright white made me look healthy which is quite an accomplishment at the moment. I love the texture of these t shirts (the kind of ribbed effect) I know you can get this kind of t shirt in Penney's and the like but I wanted it slouchy and v neck (quite specific for a simple t shirt I know). ASOS is great for having money off codes online every now and then and if you're a student you can get a student discount. Let's not forget that they also have a brilliant range of makeup as well as clothes from pretty much all price points. 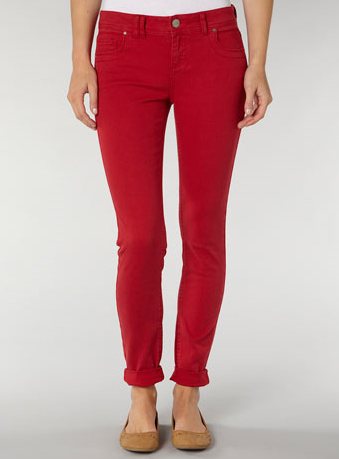 To go with my white t shirt I wore these red jeans are from Dorothy Perkins - they cost £30. Now I have discovered that there is a massive euro to sterling difference with Dorothy Perkins (like many of the UK retailers). These jeans were €40 and £30 so I tried them on in the shop and ordered them online. When you sign up with the website for newsletters they give you an introductory 10% off and there was also a promotion on with an additional 10% off so I got these for £24 (instead of €40). So along with big hair I was set. Have you bought from ASOS or Dorothy Perkins ?